The Dago area in Bandung is spotted with commerce buildings particularly fashion stores, making i tone of the favorite shopping districts in the city among visitors both domestic and foreign. The presence of several large trees along the Djuanda Street as well as in other parts of the Dago area provides a green and cool atmosphere for the visitors, who can also enjoy the beautiful architecture of some of the buildings in the area. 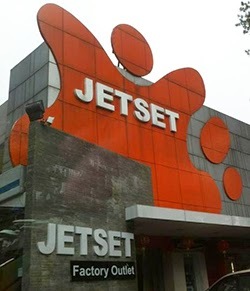 JETSET has become one of the most favorite fashion stores among visitors in Bandung because if offers a complete range of products from formal wear to informal wear, shoes, bags, belts and other kinds of accessories of the latest model. The JETSET FO is a two floor store. The first floor provides various kinds of trendy wear products and accessories such as shoes and bags for women, all of which being offered at affordable prices. Cute and trendy children wear products can also be found in this floor, making it am perfect store for families to shop for their small children. The second floor offers classy and exclusive wear products for men including shirts, T-shirts, jackets, jeans as well as accessories such as shoes, belts, eyewear, hats, etc, all of which also offered at affordable prices. JETSET FO has been established for more than six years. During the recent Idul Fitr long holiday, JETSET FO was crowded with shoppers, allowing sales at the store to surge by 100 percent.